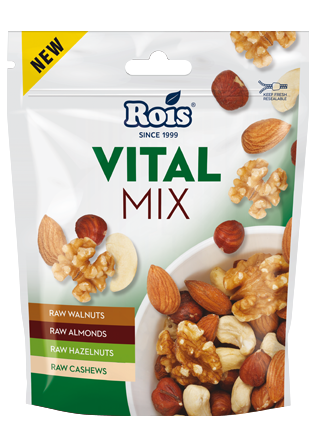 Ingredients: raw almonds, cashew, hazelnuts and walnuts. Packaged in a protective atmosphere- nitrogen. May contain traces of other tree nuts and peanuts. May contain shell fragments. 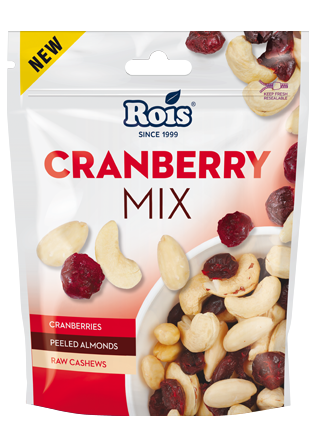 Ingredients: dried cranberries (with added sugar and sunflower oil), cashew and blanched almonds. Packaged in a protective atmosphere- nitrogen. May contain traces of other tree nuts and peanuts. May contain shell fragments. 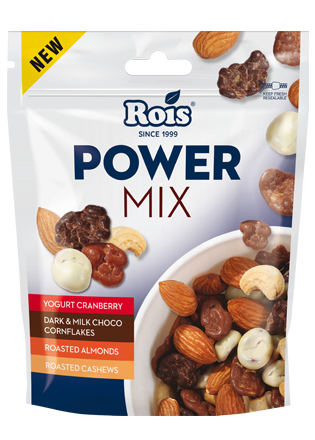 Ingredients: cashew and almonds, milk chocolate (sugar, cocoa butter, whole milk powder, cocoа mass, whey powder, emulsifier: soy lecithin; flavouring: vanilla), dark chocolate (sugar, cocoa mass, cocoa butter, emulsifiers: soy lecithin; flavouring: vanilla), white chocolate (sugar, cocoa butter, whole milk powder, lactose, skimmed milk powder, emulsifier: soy lecithin, flavouring: vanilla); corn, dried cranberries (with added sugar and sunflower oil), glazing agent: shellac; glycerol, dextrose syrup, acacia gum, wheat starch, vegetable oil, flavouring: yogurt. Packaged in a protective atmosphere-nitrogen. May contain traces of other tree nuts and peanuts. May contain shell fragments.